Goo d morning to you all and thanks for dropping by. I can't believe how quickly these two weeks pass and now it's time for our next challenge in the Christmas Card Club. Carol is hosting this this time and she wants us to use the sentiment as the focus of our card. Suits me down to the ground. I decided to use a non-Christmas embossing folder for a change. I think it looks quite masculine which is a bonus since I send a few to males on their own. This card is not due until tomorrow but I have a DT card to post then so whenever possible I try to post this one a day early. Hope you enjoy the weekend, though I think the weather has changed now. what a very super Christmas card and the colours are so lovely for Christmas. The embossing is gorgeous and I very much like that punch and the green at the bottom. Hope all is well at the Harrop Towers. 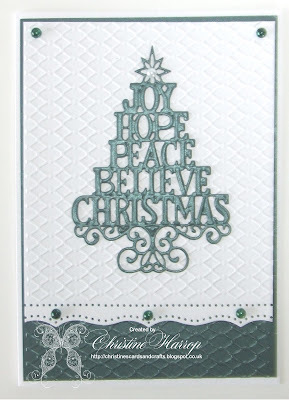 Super sentiment tree which does look very elegant with that embossing folder. This is a wonderful card, I have this due and would never have thought to use it for a sentiment challenge but it's perfect and looks fabulous in these colours too. This card is so pretty. Loving the sentiment and the card design too! I like the softer colours you chose. They are very peaceful looking and suite that sentiment! Lovely, unfussy card so just right for a fella and one of my favourite Christmas dies.